Arsenal travelled to the Camp Nou for the second edition of the ‘Beautiful Derby’. These were the two teams that actually do not know how to park a bus. But to the surprise of many, Wenger decided to try and defend, rather than attack. Stating that Arsenal parked the bus may sound ridiculous, but they certainly didn’t attack. Barcelona came out with one agenda on their mind – to keep the ball for the whole match. 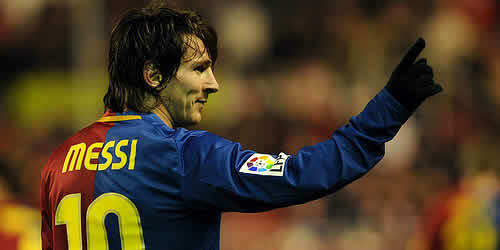 Messi was again the tormentor for Arsenal, portraying a picture of calmness for both his goals. Busquests decided to make it interesting, as he gifted an own goal to Arsenal. Bendtner could have taken Arsenal to the next round, but his first touch let him down. The red card for Van Persie had left a sense of injustice in the match, but in the end the better team progressed to the next round. The match at the Camp Nou saw a contrasting start to the game from that of Emirates. In their first leg, Barcelona didn’t start with their usual full-on pressing. But this match was different, as Pep ordered the team to get the ball immediately and never leave it. The pressing was intense, as Arsenal were pinned deep in their own half with nine men behind the ball. Arsenal had just 41 touches in the opposition half in the first half, compared to 310 by Barcelona. Barca exerted total control, trying to slice up the Arsenal’s defense. When Arsenal managed to get hold of the ball, the passing lanes were closed down rapidly and Arsenal were forced to go back or play the long ball to the isolated Van Persie. Arsenal simply didn’t have enough men in their attacking zone to play the ball forward; it was a cascading effect of Barca stretching the defense. This effectively meant that Pep achieved the goal of not allowing Arsenal to play string together more than three passes. Naturally this forced Arsenal to give up on their natural passing game. Alves – More than a defender! 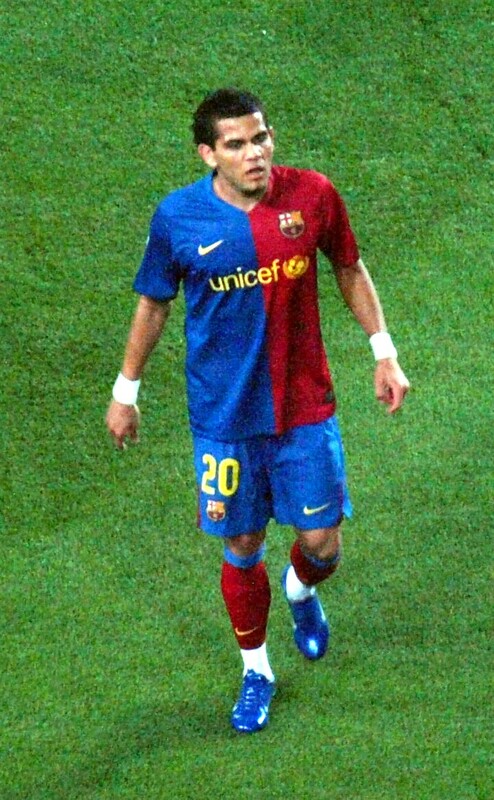 It is no news that Alves spend most of his time in the opponents half, many a time managing to settle down there for an entire game. He is a vital part of Pep’s plans. Barcelona doesn’t have a target man in the box to direct the attack. With Arsenal playing a tight defensive line, finding space between them needed width,and this is where Alves proved to be instrumental. He spent most of his time on level with the strikers. This forced Nasri to come back deep to defend, thereby eliminating a very important threat to Barca’s make shift defense. This also isolated Van Persie, who has a really good understanding with Nasri and combines well in offense. This is only possible if the team has more possession, and this is one of Pep’s chief plans. Adriano is primarily a winger who plays in left back position. Though he wasn’t as far as Alves, he was certainly far enough into Arsenal’s territory to force Rosicky to track back. This effectively stretched Arsenal’s back line, and four defenders was not enough; at times, the defensive line included six men in line. With one of Arsenal’s chief attacking threat negated, Xavi and Iniesta enjoyed more space in the midfield. The Camp Nou pitch is one of the biggest, and Barca are trained to make use of the full width of it. Barcelona, on the other hand, were in no hurry. It is a well known tactic from Pep’s side, as they kept the ball rolling on the carpet with short intrinsic passes. This left no chances of tackles and forced Arsenal to put on their best behavior in defense. As much as tiki-taka is an offensive tactic, it is equally a defensive tactic. Barcelona defended with the ball, frustrating Arsenal and wearing them out both mentally and physically. This forced Arsenal into making mistakes and hurried passes to get out of their danger area. Everytime Arsenal had the ball, they were forced to rush a pass. With most of their players in the defensive zone, Arsenal found it hard to work their way out of defense. Fabregas made the mistake of trying to play out of defense deep from his half, which consequently resulted in the first goal. Arsenal, being an attacking team, eventually left a few holes open at the back as the game progressed. The defense showed the wear and tear of running behind the ball as the game progressed. The final possession stat of 76% for Barca showed how effectively Barca kept the ball and won it back when they lost it. Arsenal having developed a reputation of an attacking team, not one that is given a due for their defense. Barcelona had a total of 20 shots at goal, with 12 of them on target. This doesn’t show the complete picture of how well their defense stopped numerous other attacks. Koscielny and Djourou had a very good match. For a majority of the first half, Arsenal managed to hold the line and kept Barca at arm’s length. Almunia may be the least favorites of keepers in Arsenal, but if it was not for him, the score would have reached double figures. On the other hand, Arsenal failed to test Barca’s makeshift defense, with no shots being registered in their name. Arsenal needed more than one Wilshere rather than Fabregas or Diaby. It is not an understatement to say that Wilshere was the best Arsenal player on the field, and it was he who kept Arsenal’s midfield line intact. He was the only one who had the stamina and work ethic to do the running and hustling to get the ball back. He needed more support than he got from his fellow midfielders. It was a pity that he was pushed so deep in his own half, as he couldn’t influence any attack for Arsenal. Fabregas and Diaby were invisible as Iniesta and Xavi forced them to chase shadows. This was largely because of Barcelona’s possession game and their passing, but one more player like Wilshere could have resulted in Arsenal having little more possession than they had on the night. He was doing the running till the last moment; he set up Bendtner in the 88th minute with a beautiful pass, good enough to be converted and resulting in Arsenal progressing at Barca’s expense..Wilshere has truly arrived on the scene, and has a great future ahead of him. Sometimes it is impossible to do anything against this little man. Arsenal seems to be his favorite opponent in UCL, as he has now scored six against them. Messi is a defender’s nightmare; with his new role as a false nine, he now has more freedom and roams around the whole pitch. The defenders now have a new headache. With no one to mark, they are forced to kick each other, as Messi doesn’t usually stay upfront. If one defender follows him, it opens up spaces in defense. If Messi is allowed to come unmarked in midfield, it creates a numerical advantage for Barca in midfield, where they are anyway the strongest. Koscielny did a remarkable job on Messi in both the matches, but it is impossible to keep him out of the game for long. 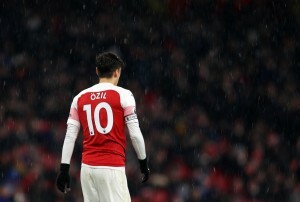 His first goal makes one simply look in awe; he lobbed the ball to take it out of reach from Almunia and volleyed it in. Messi was continually dropping in the midfield, and was dragging the defense around. His penalty under pressure was so calmly converted, and it put Barca into the quarter finals yet again. The standard of refereeing leaves a lot to desire. Arsenal tried to intimidate Barca earlier in the game with few rough challenges, and there was a feeling that the game could boil over. Van Persie lost his cool as he pushed Alves in his face, which the Brazilian may have exaggerated a little in his reactions, earning the Dutchman his first yellow card. As the second half progressed, the referee made a dubious call and showed Van Persie a second yellow for taking the shot a mere second after the whistle had gone, thereby reducing Arsenal to 10 men. He also got few other decisions wrong in the match, which included a clear penalty for a foul on Messi. The game didn’t deserve such unwanted attention, and the referee’s gaffes left a bitter feeling in the mouth of Arsenal fans in this match. It was indeed a great game of football in which one team had the ball and other team couldn’t get hold of it. This game witnessed possession game at its best. With a makeshift defense, Barcelona guarded their backline by keeping the ball and not letting Arsenal attack. Wenger could have played little more adventurous strategy, as their zero attempts on target is a worrying thing. In the end, the better team won and progressed. It was a master class from Pep Guardiola’s team, who at the end came out as the most beautiful of the two.